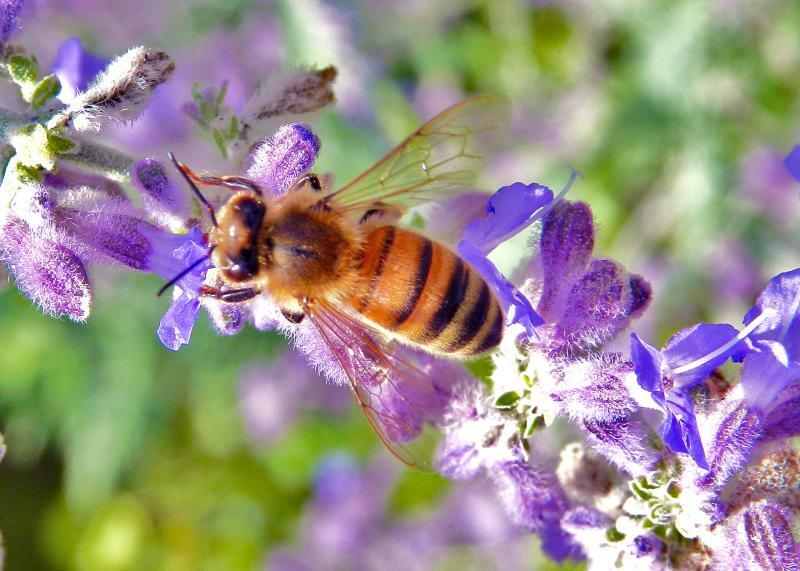 The Lithopolis Honeyfest Honey Bake-Off is designed to encourage the everyday cook to discover the many benefits of using honey, not just as a sweetener of choice, but as a common ingredient in a variety of recipes. You are not only adding healthy sweetness and rich flavor when you cook with honey, you are adding vitamins, minerals and antioxidants! In recipes not calling for any liquid – add 2 tablespoons flour to each cup honey. Add ½ teaspoon baking soda for each cup honey used. To avoid over browning, reduce the oven temperature by 25 degrees F if it is a recipe not originally written for honey. Oil of spray the liquid measuring cup to make it easy for the honey to slide out after measuring. To re-liquefy honey that has crystallized , remove lid and place container of honey in a sauce pan of water, heat water to hot simmer (do not boil) stir honey occasionally to distribute heat. One 12oz. jar of honey is one cup. Don’t forget honey or flavored honeys for a drizzle on baked goods, ice creams, pudding or other desserts.. Entry must be covered and set on or inside a disposable container. One entry per container. No refrigeration available. Contestants limited to one entry per category. Entrants’ name is not to be anywhere on their item, neither on the container or recipe form. Violating this rule may result in disqualification. As a courtesy to other entrants, entries received after official registration or that do not fit into a specified category will be ineligible for judging but would be appreciated as a donation for the bake sale. A selection of entries will be chosen to be published in the next edition of Taste Of Honey – A Collection of Recipes, Tips and Witticisms. 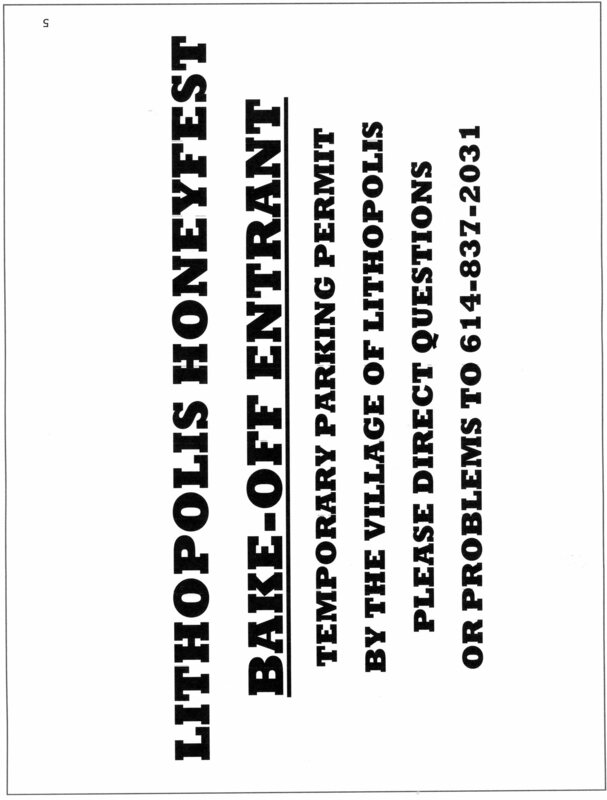 Entries are the property of the Lithopolis Honeyfest and will be sold by bake sale. All proceeds go toward operating costs of the Lithopolis Honeyfest. Registration is Friday September 7, between 3 and 7 pm. Bring entry, Entry form and Recipe form. Entries must be taken directly to Wagnalls Memorial Library, 150 E Columbus St. Entries will be accepted on Friday, September 7th from 3 till 7 PM. Please park in the library lot behind Wagnalls to drop off your entries. Place temporary parking permit notice (page 5) in plain sight in front window. An Exhibitor Number will be assigned to each entrant at registration. The entrant’s Exhibitor Number will be placed on each of their entries. Judging will take place Friday evening at 7:00pm – judging not open to the public. Entries will be judged on (1) Use of Honey – required amount of honey for entry. (2) Flavor – great taste (3) Texture – smooth and moist and (4) Appearance – pleasing to the eye. Class 7 – Munchies – Unique or imaginative snack using honey, ie pop corn, granola, snack mix. Honey must be 50% of all sweeteners. Winners will be announced between 10 and 11 am Saturday, Sept.7th. at the Festival Stage. Winners will also be posted near the stage on a winners board. It is the responsibility of each contestant to pick up their awards at the stage as they are announced or between 11AM and 7Pm on Saturday, Sept 8th 2018. If you cannot attend on Saturday, the please provide a self addressed envelope and bring it when you register your entries.